What’s sweeter than love? Ice cream of course! This season, satisfy your inner sweet tooth with a deliciously cold scoop especially under the typical Malaysian hot weather for an experience like no other. 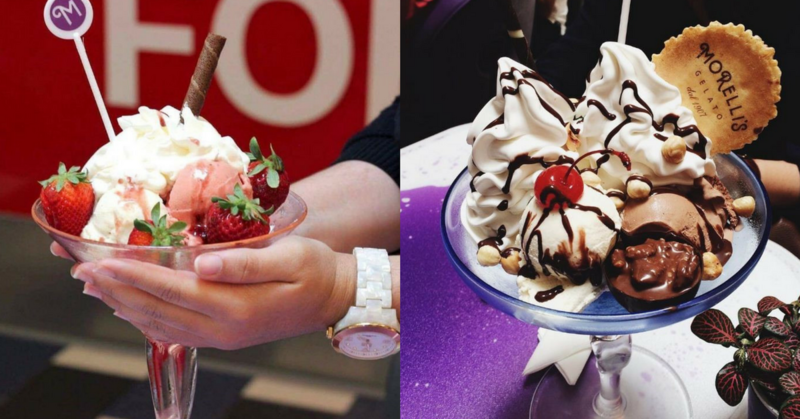 Forget Baskin Robbins and Haagen Daz, these dessert joints serve much more than just your typical scoops. Bringing the lava cookie craze all the way from Thailand to our Malaysian shores, Creamery has all the right reasons for its famed status. Known for its innovative combination of molten lava cookie with a single scoop of ice-cream on top, the crackling warmth from the fresh cookie will create a beautiful mess out of the melting scoop on top, ingeniously designed with playful mesh of hot and cold. Presenting a dazzling choice of ice-cream toppings and cookie flavours from Choc-A-Lot to Monster Matcha, you’re definitely in for a sweet treat! Whimsical with an adult twist, The Ice Cream Bar is the kind of dessert parlour your parents wouldn’t want you stepping into. No, not that kind (what exactly are you thinking?! ), but one with an alcoholic infusion! Serving up a creative array of flavours from Smoked Cognac and XO Strawberry among many others, get just a tad bit tipsy licking your way through these 18-rated desserts. Yums! Fancy ice-cream in your salad? Or perhaps some creamy delight with chunky beef bacon bits in your Big Breakfast set is more suited to your palate? Kickstarting the local twist to regular gelato five years ago with their infamous Nasi Lemak Gelato, Whimsical Caffe is showing little signs of slowing down from their rave reviews and original inventions. Must try: Cotton Candy Affogato, delivering a melty pleasant surprise of coconut and gula melaka gelato hidden underneath the sweet fluff of cotton candy. What more, it makes for a pretty cool #FOTD shot! Claiming one of the few top spots for the status of best gelato in town, this internationally acclaimed brand has rightfully garnered its coveted status though sheer dedication and top-notch quality. Spanning an impressive history of over a hundred years all the way from Italy, Morelli’s serves up a delectable variation of irresistible sundae cups. If you’re up for a romantic date out with bae, this makes for the perfect spot! Bonus point: Nasi Lemak Ice Cream! Specially reserved for the super adventurous, take a bold step forward and indulge in this jaw-dropping rendition of a popular local delicacy, the famous Nasi Lemak! Now available in dessert form (complete with ingredients and all! ), Skream‘s version offers exactly like the original sans the coconut rice which has been replaced by a scoop of creamy ice-cream.